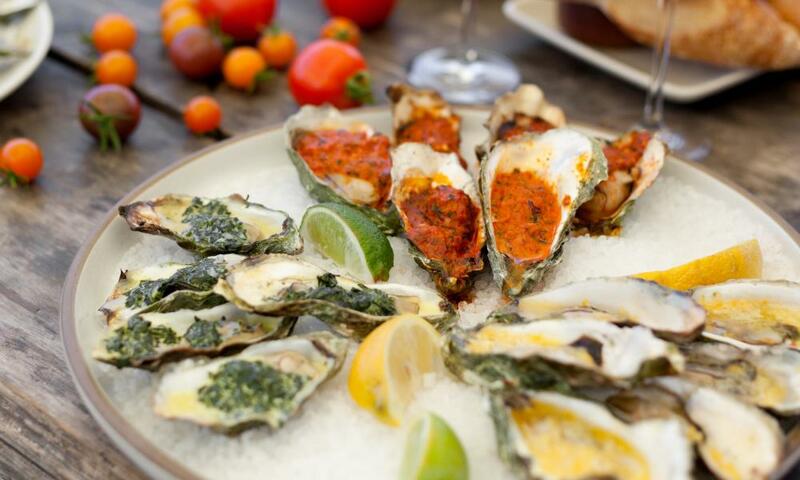 Hog Island Oyster Bar at Oxbow Public Market offers the freshest oyster experience. Hog Island Oyster Co. sustainably farms oysters and shellfish just 50 miles west of Napa in Tomales Bay, CA and delivers it daily to their Oxbow location. Favorite menu items include the fresh oyster platters, a Cowgirl Creamery grilled cheese and Manila clam chowder. Their grilled oysters are shown in the picture above. Eiko’s at Oxbow serves a variety of fresh fish in several ways – try the Hawaiian Poki bowl with Freshly Diced Ahi Tuna, Sliced Maui Onion, Green Onion, Ginger, Avocado, Daikon Sprouts, and Savory Sesame Soy Sauce. If you are in a hurry, try their Grab & Go items located in the drinks section. For example, they make fresh daily Confit Albacore Tuna Salad. Thomas Keller’s Bouchon Bistro in Yountville has a large portion of the menu dedicated to seafood and features everything from clams to lobster. Their most over-the-top item is the “Grand Plateau” featuring a special selection of 1 lobster, 16 oysters, 4 shrimp, 8 clams, 10 mussels and seasonal crab. Chef Keller recommends pairing it with Pascal Cotat, Chavignol, “Les Monts Damnés,” Sancerre. Evangeline in Calistoga is a casual French bistro with a creole soul. Their killer Seafood Tower includes oysters, lump crab meat, chilled Gulf shrimp, Maine lobster. Ok now you’re hungry and know where to go, but let us help plan the rest of your trip.